If you are wondering whether the symptoms you are experiencing are an indicator of sleep apnea, you should consult a board certified physician for sleep medicine. These doctors can set a sleep apnea diagnosis based on the medical and family history of the patient, a physical exam and results from a sleep study. Of course, you will first visit your primary care doctor for any symptoms you are experiencing. This doctor may be the first one to evaluate the symptoms and if they think you may be suffering from sleep apnea, they will decide that you need to see a specialist. Sleep specialists diagnose and treat people with any type of sleep problem. There are many doctors that can be sleep specialists, including lung specialists, nerve, ear, and throat and nose specialists. These specialists can choose to diagnose your sleep problems by using a home sleep apnea test or an in-lab sleep study. However, in order to do this, they will have to know your full medical and health history and your symptoms. When speaking to a specialist about your symptoms, you will have to tell them when they began, how frequent they are and how often they happen. If you do not know this because you do not wake up when they occur, you can ask your sleep partner whether you snore or make weird noises in your sleep, such as choking. Keeping a sleep diary can also help the doctor set the diagnosis more easily. A diary that is kept for at least two weeks should include information such as the time you go to bed, the time you wake up in the morning and the frequency of times you wake up during the night. If your sleep partner can write down the rest, regarding your symptoms, the more effective your sleep diary would be. If you are experiencing symptoms that lead you to believe that you have a sleep disorder, you should visit the doctor immediately. Bringing your diary with you is very helpful. The diary should not only consist of the time you go and get out of bed, but of any other symptoms you are experiencing. For example, you need to write down how you feel in the morning and whether you feel exhaustion and sleepiness during the day. At the appointment, the doctors will ask you questions regarding your diary and sleep quality. Additionally, they will ask questions about your daily activities and how well you can perform them now that you are experiencing some sleep difficulties. Additionally, if someone says that you snore or make weird gasping or choking noises, the doctor should know how loud they are and how often they occur during the night. Ask your sleep partner to pay attention to them and report them. It is extremely important that you tell the doctor of any medical conditions you have had in the past and the family history. If anyone in your family has been diagnosed with sleep disorders, you are at higher risk of developing the condition, too. Even if they have not been diagnosed, try to think if they experienced some sleeping issues. Many patients of sleep apnea do not detect this condition and therefore, are not diagnosed. Aside from the medical and health history and the evaluation of your symptoms, the doctors will do a physical exam to check the reason behind your sleeping problems. They will check the nose, mouth and throat and look for large or extra tissues that can make it difficult to breathe. In case of children, they would also check for enlarged tonsils since this is usually the case if a child has sleep apnea. In the majority of cases of children with sleep apnea, the doctors may need only a medical history and a physical exam to diagnose this condition. 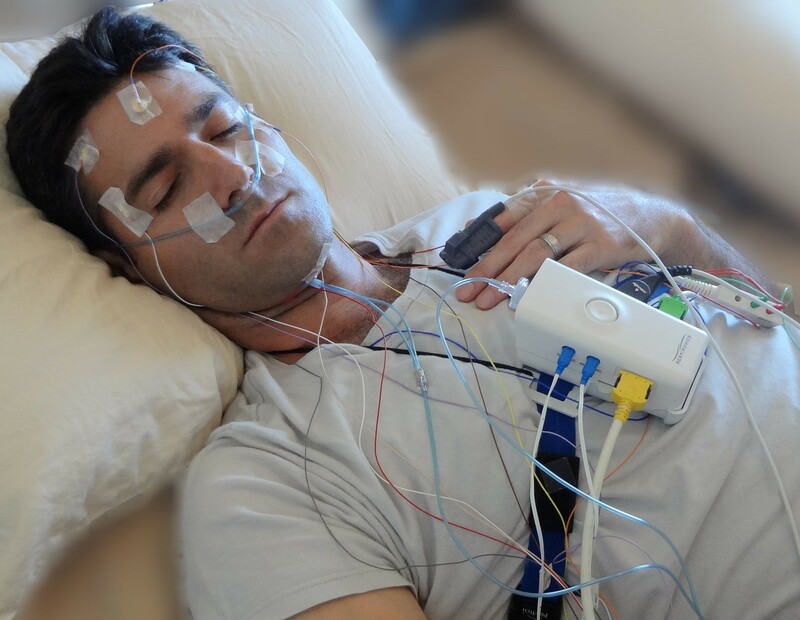 Sleep apnea tests come in the form of sleep studies. These studies measure the length and quality of sleep and the reaction of the body to the sleep problems. Doctors often use such tests to determine whether their patients have a sleep disorder, what kind of sleep disorder they have and how severe it is. These are the most accurate diagnostic tests known for diagnosing sleep apnea in patients. This first type of sleep requires the patient to sleep at a sleep center that usually resembles a room in a hotel. In order to check the quality of sleep, the patient has sensors hooked to their body, which have the purpose of recording the heartbeat, breathing, brain waves and movement. This option is more expensive than the in-home study, so it is usually recommended in difficult cases where doctors cannot make a diagnosis easily. It is the most accurate sleep study for diagnosing sleep apnea since it can precisely record the eye movements, heart rate, brain activity and blood pressure in the patient. This test is also called the polysomnogram. Aside from this, the PSG also records the air movement in the nose while people breathe, the oxygen in the body and the blood, the snoring and movement of the chest. The chest movements are an indicator of the effort a person makes to breathe. The test is completely painless and it only uses sensors attached to the finger, limbs, face, scalp and chest of the patient. In the morning, the specialist checks the results to see the severity of the sleep disorder, the type and diagnose sleep apnea. These results are also very helpful in the planning of the sleep apnea treatment. For example the most common and effective treatment is the continuous positive airway pressure and the doctor can use the results from the PSG to find the best setting they can use in terms of this type of treatment. If the doctors think that you may suffer from sleep apnea, they can also choose a different night sleep study called the split-night sleep study. This study contains of two parts. In the first, the PSG checks if the patient has the condition and its severity. If the test is positive and does confirm that you have sleep apnea, the second part consists using a CPAP machine that will help the doctor to choose the best setting for you. When people do not have any other health issues and their family history is clear of sleep disorders, they are usually good candidates for this type of testing. This type allows patients to sleep more comfortably since they are in their own home and it uses only a small monitor that will collect the important information doctors need for diagnosis while the person is asleep. This particular testing is less complicated than that used in the first type of testing, so it is very easy to use. After the person uses it, they can send it or take it to the sleep specialist where he can set the diagnosis. The equipment used while the person is asleep collects all relevant information about the breathing of the patient during the sleep. There are plenty of different testing devices for home sleep apnea testing ant they all have different sensors and different equipment. However, they all have the same purpose – measuring things that will indicate whether you have a sleep apnea or not. Such tests measure the heart rate, breathing, blood oxygen level and other things that may be relevant for the diagnosis and treatment. Home sleep apnea tests are usually recommended if patients have moderate to severe sleep apnea and have no other medical conditions than this particular suspected sleep disorder. People who are not at high risk of obstructive sleep apnea, have another disorder or other medical conditions are not recommended this type of test. Other medical conditions that lead to doctors avoiding this test are pulmonary diseases, congestive heart failure or neuromuscular diseases. In such cases, the sleep specialist usually recommends an in-lab sleep study. If the doctor decides that you need an at-home testing, they may recommend a portable monitor that records the most important information as the PSG in the in-lab sleep study. Aside from these, there are other sleep tracking devices that people sometimes use to detect and diagnose this particular condition. However, these two types of testings are proven to be most reliable and lead to the best possible treatment. You should always discuss symptoms with your doctor. If they diagnose you with sleep apnea, you need to schedule a follow-up to discuss the results and plan the treatment with the doctor. A diagnosis for sleep apnea is not a simple decision for a doctor, so you must make sure that you provide them with only true information. A doctor will have to know the exact symptoms. their frequency and severity, the other condition the person has in the same time or has had in the past, the family medical history and any related sleep disorders and the medications a person is taking. With all these things at their disposals, doctors will find it much easier to diagnose the patient properly.